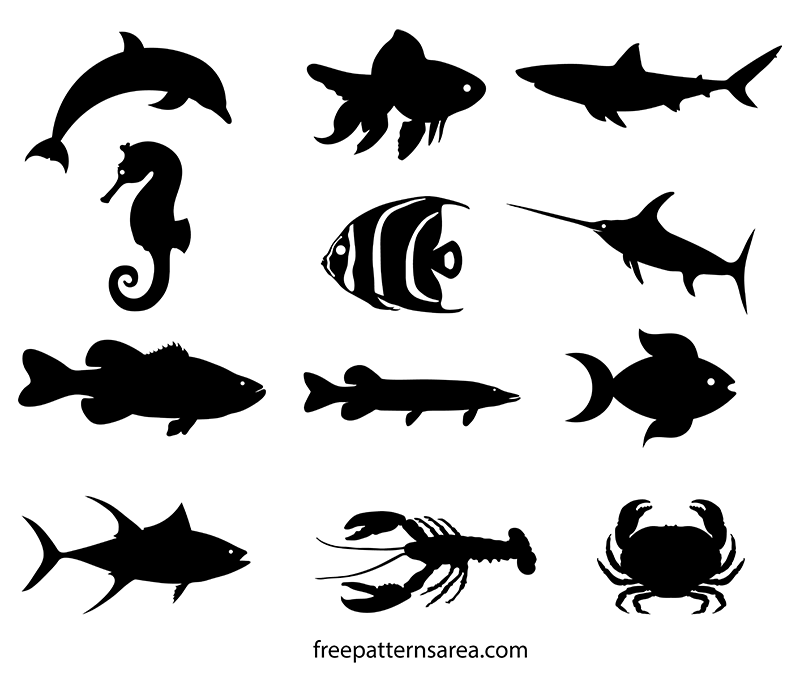 12 free fish shapes design set. You can download Silhouette clipart EPS vector, Printable Cut Out PDF Templates, 2D CAD dxf dwg, SVG image, black white PNG graphic and 3D stl files for free. We want this designs to give inspiration to many different industries. Therefore we spare more time to prepare many different file formats. For instance, as they can be used as template in house building crafting projects, they can be used as a digital cutting file compatible with industrial type CNC cutting machines. As it can be used in graphics vector projects, it can be also used as a tattoo template. 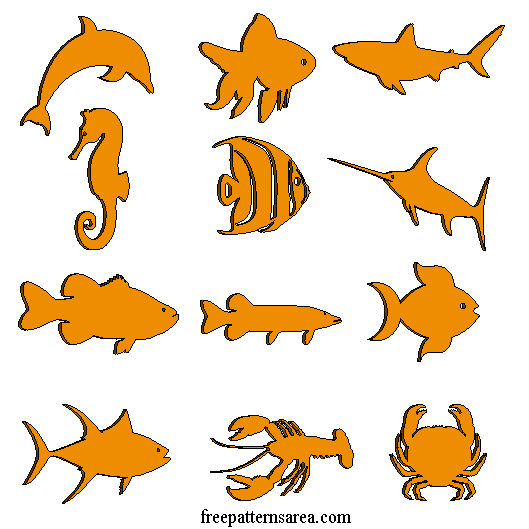 We have drawn a set consisting of salt and clean water creatures with their silhouette images. 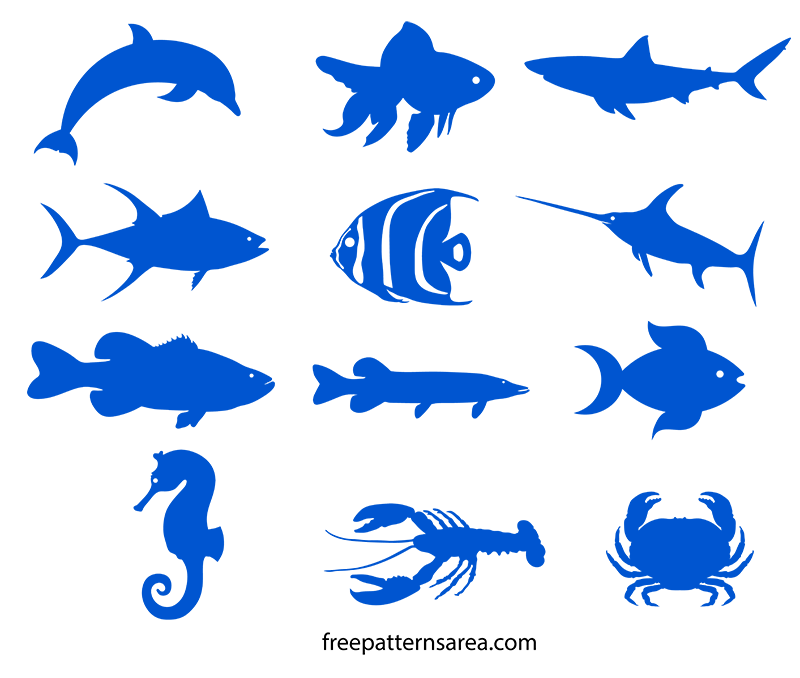 Dolphin, great white shark, fantail goldfish, marlin swordfish, French angelfish, seahorse, largemouth bass, northern pike, tuna yellowfin, crab, lobster are some of our favorite sea creatures and fishes. We have given a place to them in our design. Pick the ones you like. As we mentioned before, you can use them for different purposes. You can use it as an ornament in crafting projects for personal use. 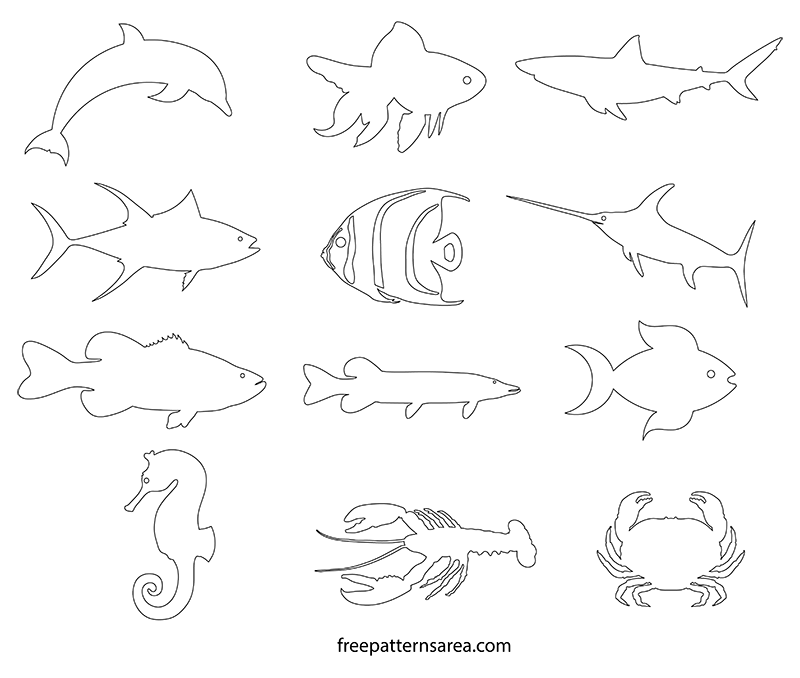 Download the pdf file for free for your stencil, template, die-cut, cutout, template needs. You can prepare coloring book for preschool children, use it as a vector in your graphics works. Use it as clipart in your powerpoint presentations. Use them on cutting machines such as decal maker machine, Cricut, digital paper cutter, vinyl cutting machine, stencil maker machine, plotter cutter. Use them as a digital cutting file in industrial CNC router, Co2 laser cutter, and laser plasma metal cutters. You can use many different materials such as paper, wood, leather, vinyl, metal acrylic, felt. 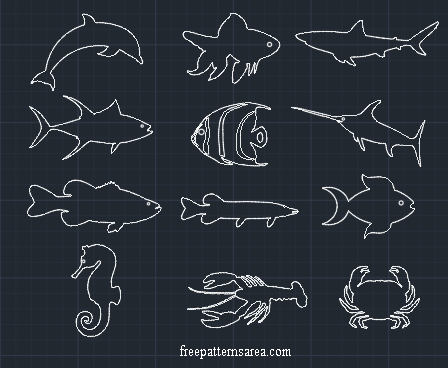 Download free fish vector, template and CAD drawing files.